E-cigs versus Cigarettes - could vaping help smokers quit smoking? Well, according to a study published in the New England Journal of Medicine, e-cigs outdo other nicotine replacements, such as gum, and patches. Nearly 900 middle-aged smokers were assigned either e-cigs or nicotine replacements. 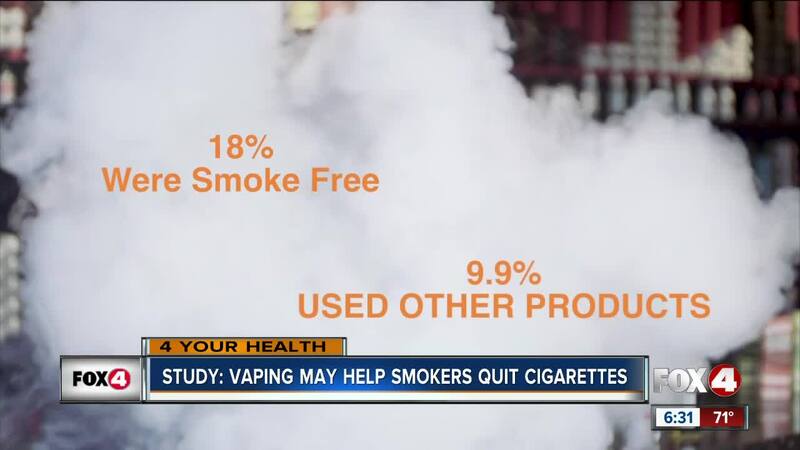 The study says after one year, 18% of those e-cigarette users were smoke-free vs. almost 10% of those who were using other products. Geoff Laday, who works for 'The King of Vape,' Cape Coral says vaping helped him quit smoking. He believes vaping can help anyone quit. “I tried different things, the patch, the acupuncture, gum, Chantix everything, I started vaping, and I noticed it was helping,” Laday said. According to the Center for Disease Control and Prevention, when burned, cigarettes have about 7,000 different chemicals in them. E-cigs have far less. “Which would you rather do, if rather put less in my body, with a better chance of bad things not happening,” Laday said. Looking into the study more, Fox 4 contacted Robert Hawkes, the Physician Assistant Director at Florida Gulf Coast University. He says there’s no clear answer to whether or not it helps people quit smoking. “Vaping certainly is inhaling the nicotine which is obviously what’s helping folks. Whether it actually helps them quit that, I’m not 100% specific on,” Hawkes said. Hawkes isn’t endorsing e-cigs by any means and went on to add, time will tell when it comes to vaping. “It’s so new we don’t know some of the long term implications of it, what’s going to happen 10 to 15 years from now, I don’t think we know that yet,” he said. In the US there is no approved vaping product to help smokers stop smoking cigarettes.